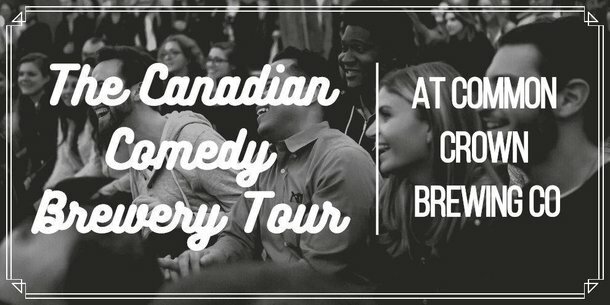 The Canadian Comedy Brewery Tour brings comedians to local breweries and wineries across Canada for evenings of drinking and laughing! Looking for something fun to do in Calgary while also supporting a great cause? Join us for an evening of laughing and drinking at Common Crown Brewing Company, where you can sample their delicious year-round core beers, such as the Coppersmith Brown Ale and the Brewmaster Blonde Ale. Or, you can try your hand at their rotating seasonal beers and collaborations while you enjoy the entertainment for the evening. The Canadian Comedy Brewery Tour brings the best of the best North American comedians to local breweries and wineries across Canada for an evening that keeps the beers flowing, and the laughs coming.This nationwide tour has already hit countless breweries in the United States, and is now making its way into the best breweries across Canada. Our comics have travelled across North America, sampling local fare, tasting local brews, and providing a truly unique comedy experience that supports animals in need. This stop features a lineup of comics that will fill your belly with laughs. We provide the absolute funniest in comedy entertainment, with our comics having credits at top festivals, on TV, and in major national and international clubs. All you need to do is come ready to laugh.